Often, buying in bulk can save you money. Say, picking up a 3-pack of shovels at Costco – you only really needed one shovel, but if you buy three, it’s like you’re paying for two and getting the third one free. So before you know it, the shovels have made it into your cart, past the checker and into your trunk. How about cases where buying in bulk does not save you money? 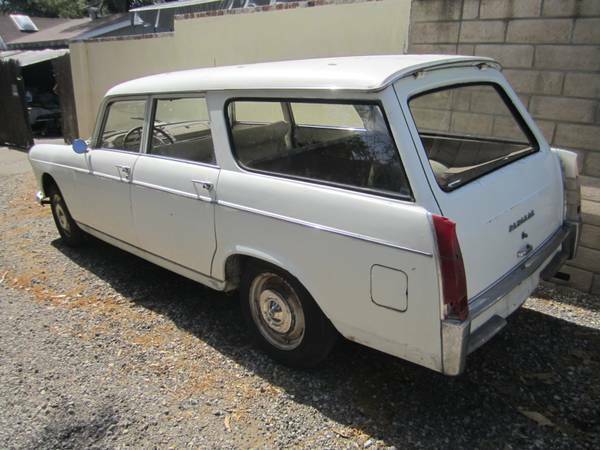 Well, a nice driver Peugeot 404 sedan is typically around $4000 (more on that in a future feature), but for half the price, you can get a full set of 3 wagons! 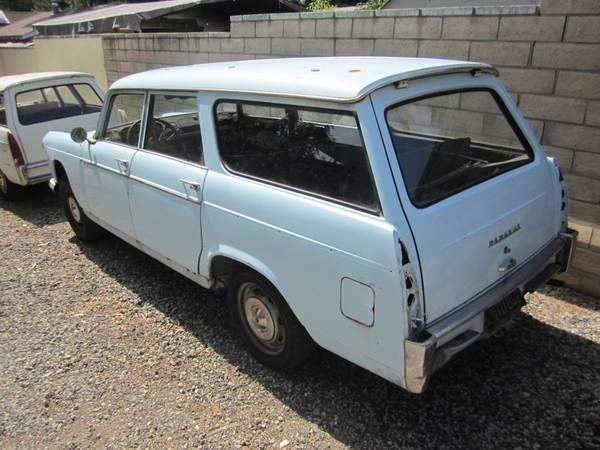 Check out this set of Peugeot 404 Break for sale for $1950 in Tarzana, CA. This might be the best dollars-per-pound deal ever featured here, but the costs will start right away – unless you live in an industrial area, you’ll have to find somewhere to park three 15-foot-long cars. 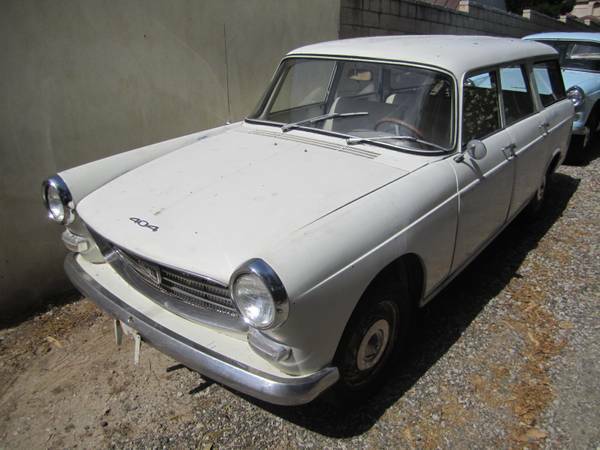 The white 1964 – oddly enough, the oldest one is in the best shape – is said to be rust-free, its running engine powering the rear wheels via a 4-speed manual transmission. It’s also said to have a new starter, and to feature the early-style dash with ribbon-type speedometer. No indication is given as to why this car is off the road – it looks complete, and if you’re lucky, a fluids/hoses/hydraulics resurrection might bring it back. Their reputation for durability is incredible, so it’s hard to imagine a car that looks this good would have a major drivetrain failure. The only visible flaw here is the seriously faded tail light. The blue car is a 1966, sporting the apparently rare 3rd row seat. It is also a 4-speed car, and with no engine installed, the obvious question is whether a later Peugeot engine might fit – how about the K-Jetronic XN6 or one of the turbocharged N9T series? No doubt someone in Algeria or Tunisia has fabricated an adaptor, so just send your money and presto, you’ll have the fastest 404 in North America. Of course, you’ll want to take care of the floor rust, and pick up some lenses for your lights, but other than that, this car looks pretty complete. The 1968 parts car is a rolling car with no engine, automatic transmission, and what looks to be damage sustained in a minor front-end impact. It’s missing most of its exterior trim, but seems to have held on to its interior (though that’s of dubious value if you look at the exterior oxidation). 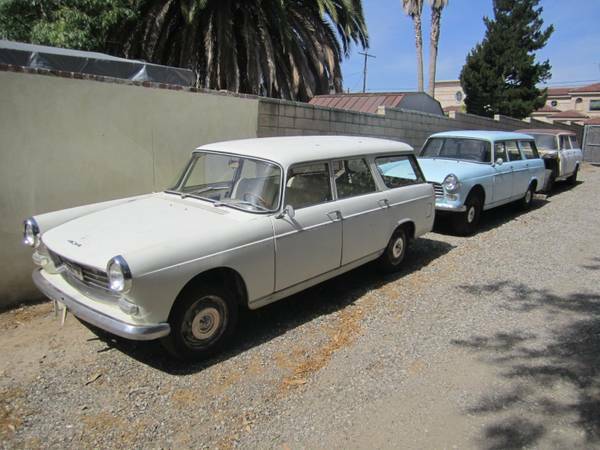 This truly is a neat little trio of cars, and given America’s love for slow, durable wagons (look at all the love given to old Volvo and Mercedes wagons), it’s hard to see why they aren’t more popular. This entry was posted on June 4, 2014 at 10:38 am and is filed under Feature. You can follow any responses to this entry through the RSS 2.0 feed. You can leave a response, or trackback from your own site. Nice, glad to see these finding homes. Saw the 8-seater listed for sale recently, so hopefully that one gets revived too.